Bat Storm's Bitter Sweet Moment is my second collaboration with Cartoon King a.k.a. Mathieu Leader (the first being Undead and Unemployed). Matt really wanted to write a Bat Storm story so I said okay. It's fair to say Matt and I did quite a bit of back forthing over the script with a couple of re-writes. The problem we had initially was Matt was writing for Batman not Bat Storm with a script that was actually too large for Bat Storm's world. Which is something any aspiring writer should take note of. If you're going to write for someone else's characters you need to learn who those characters are. Matt scaled it back and came up with this story about Bat Storm's past as an unsuccessful small time thief. The first thing you may have noticed is that the title refers to this episode as 'Alternate Universe'. This is something similar to what DC Comics have done with Batman which allows other writers to come in and write for Batman but what happens in the comic is not considered Batman 'cannon'. The same goes for this episode. Matt deals with Bat Storm's past as a criminal and even gives Bat Storm a real name. These are things that I haven't really thought much about myself so I didn't want to be tied to the events in this story. Hence this is an alternate universe to that you see in the episodes written by me. Matt again chose all the music used and it was his decision to use stick figures for the flash back (not a choice I would have made myself). Bat Storm's leap over the Donut shop counter - makes me laugh every time! Bat Storm crashing into the guy with the donuts - I think I managed to animate this sequence particularly well. There's really not a lot more to say about this animation. It's fairly straight forward and quite a bit of fun. 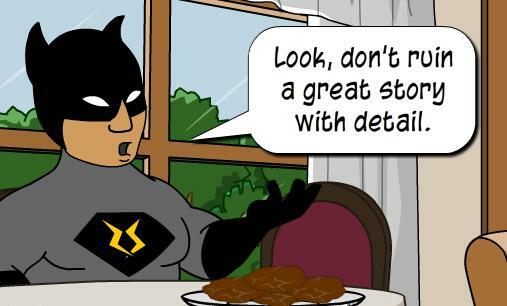 It's interesting to see how other people write for Bat Storm too.